WE'RE in the high season for the second home. Everywhere you look, as the Labor Day weekend approaches, someone is packing up for the Hamptons, the Vineyard, Nantucket or Tahoe. I'm told that there are unbounded thrills to be had on these sojourns, but I've never experienced them. Not only do I not own a second home, I don't even own a first. Still, a few of my dearest friends own second homes (I forgive them for it), and one thing has always puzzled me. When you leave your second home, and as September proceeds many will do so, how do you keep it safe? Houses are given to disrepair, and they can fall victim not only to human threats (burglary, vandalism, piled-up takeout menus) but also to natural disasters and freak plumbing catastrophes. Second homes are, understandably, far away from first homes in most cases, and the greater the distance, the greater the complexities. Also, many who own second homes rent them to vacationers. Vacation rental sites like Airbnb have turned second homes into cash machines. But renting raises other security questions: How do you deliver and retrieve the keys? How can you make sure the renters haven't ransacked the place? I recently looked into these questions and discovered several technologies that might ease the mind of those who own second homes. Let's start with the cheap and quick. One important goal for the security of a second home is to disguise the status of the house: you want others to perceive it as a primary residence. That's where the venerable light and appliance timer comes in. Today's timers aren't clunky, difficult-to-use dials. I found several digital models, meaning they are as easy to operate as a microwave. They're also inexpensive. The Stanley 38425 TimerMax Digislim sells for about $13 for a pack of two. They were unbelievably simple to use. I was able to set their on-off times without consulting the manual. Better yet, each timer is tiny, so you can install two in the same wall outlet. I also liked the more sophisticated Woods 59377 Digital 7-Day Lamp/Appliance Timer, which sells for about $14. This model is slightly harder to use than the Stanley, but it offers several additional features. You can set up to eight different on-off times over a week, or select random mode, with your lights switching on and off in a different pattern every day. This might throw off would-be burglars: the unpredictability suggests that a vigilant insomniac lives there. Another cheap, if slightly goofy, security tactic is to fake out the bad guys. Hardware stores sell a wide range of phony security signs and other gadgets to make a second home look better protected than it is. I picked up a dummy security camera made by a company called UniquExceptional for about $20; it's made of plastic, but if mounted up high it would look indistinguishable from the real thing. It even has a blinking light, suggesting that it really is doing something. Next, I tried something real: the Linkl Wireless Keypad Deadbolt by Schlage. This lock can be controlled by key or by code. Type in a code, and the bolt opens. But the system also connects to the Internet, so you can control it from afar. I didn't install the deadbolt on my front door (as I said, I rent), but I put it on a small sample door mount that Schlage sent me for testing purposes. I found the physical installation simple. If you're replacing a deadbolt, you'll likely need only a screwdriver. To control it remotely, you'll also need an Internet connection at your property. There are several features of the Schlage lock that may prove useful. You can lock or unlock the door from any Internet-connected computer, and from most cellphones, too, so you can open the door for a maintenance worker while you're at the gym, for example. Even better, you can set up different entry codes for different people: you can give your cleaning service a code that is active only on the day of the week that your house is to be cleaned. This feature is useful for renters, too; instead of giving them a key, just create a code for them for the duration of their stay. And the lock keeps a log of entries and exits; it can even send you text or e-mail alerts for each of these events. If your cleaning service doesn't show up, or if it shows up and stays for only 10 minutes, you'll know it from a distance. A lock that's connected to the Internet raises an obvious question: What happens when your broadband line or the electricity at your second home fails? The company says that the lock will still work without power or Internet access at your second home, but you won't be able to remotely access your lock, or change codes, during the downtime. The Schlage wireless lock starter kit, which includes the lock plus a ''bridge'' to your Internet line, sells for about $300. To get some advanced features, like text alerts and the ability to schedule when certain codes will work, you must also buy a subscription plan, for about $9 a month. I also tested Logitech's Alert line of Internet-connected surveillance cameras, which allow you to monitor up to six locations in your second home from your PC or cellphone. Internet-linked cameras are usually tricky to set up, but these were a breeze. Plug in a central controller to your router, and then plug in each camera anywhere you like. The cameras sync up to the main module instantly, and they can be configured in useful ways. For one, they offer motion-detection; a camera will start recording whenever there is movement in its field of vision. (You can even set designated areas on the screen to look for motion, which allows you to exclude, say, wind-blown trees.) The cameras also can be configured to send you an e-mail when they notice motion. Each Logitech camera has a storage card that holds up to a couple of weeks of video. You can access these videos using Logitech's intuitive PC or Mac software, or through the Web. The system isn't cheap: To get the Alert, you need to buy a master system, which includes one camera and the central command unit. The system is about $300 for a kit with an indoor camera, and about $350 for one that has a weatherproof, outdoor camera (which also has a stunning night-vision feature). Each additional indoor camera sells for about $230, and each added outdoor camera for about $280. You can watch video from any of the cameras for free from afar, but if you want to configure the system remotely, you need to subscribe to Logitech's Web and Mobile Commander service, which sells for about $80 a year. Altogether, then, you could be looking at several hundred dollars of equipment. But if your house is robbed or vandalized and you catch the perpetrator on tape, the investment could prove well worth it. The Schlage deadbolt and the Logitech Alert system are great for do-it-yourself types, but others may want a professionally installed alarm system, like the one made by Alarm.com. 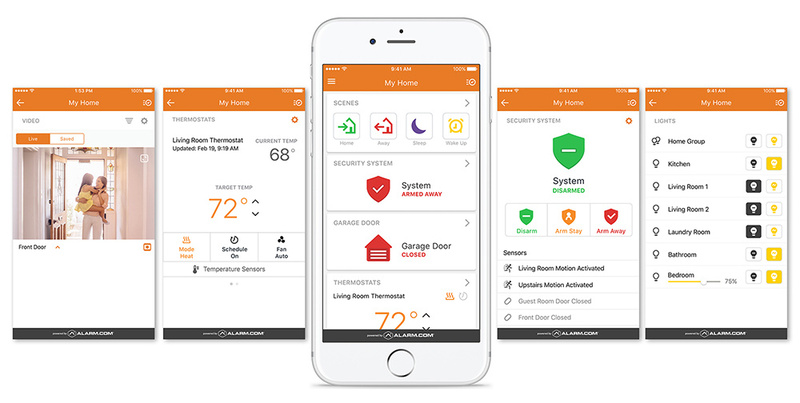 The firm's technology combines electronic locks, Internet surveillance cameras and even a few ''home automation'' features (like remotely adjustable thermostats or lighting) in a single control panel that is accessible on the Web or through smartphones. The company recently ushered me through an online demonstration. The cameras and sensors were installed in its corporate office, and I controlled them from the Web site. I found the system powerful and easy to use. I especially liked the way the system's components work together. For instance, if someone locks the door and leaves the house, the air-conditioner can be configured to shut off to save energy. One can buy and install Alarm.com systems, which are sold by authorized security dealers, starting at about $200 to $500 or more, depending on the size of your house. Dealers usually add a monthly subscription fee of $30 or $40. Not cheap. But if you wanted cheap, you wouldn't have that second home in the first place. This article has been revised to reflect the following correction: The Home Tech column last week, about security devices for vacation homes, referred imprecisely to a feature of the LiNK Wireless Keypad Deadbolt by Schlage. A code that allows the deadbolt to be opened can be set and changed remotely with a computer or cellphone, but the deadbolt itself must be opened and closed manually.